This article originally appeared in the March 26, 2018 issue of SpaceNews magazine. Over the next several months, four Falcon 9 rockets will lift off from California, starting with a launch scheduled for March 29. 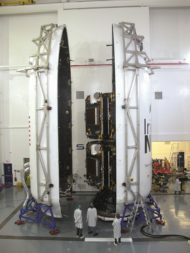 They will place into orbit the remaining 35 satellites of the Iridium Next constellation. (One of the rockets will carry only five satellites, sharing the launch with a U.S.-German Earth science mission.) Those satellites will join the 40 satellites launched last year, completing the constellation. 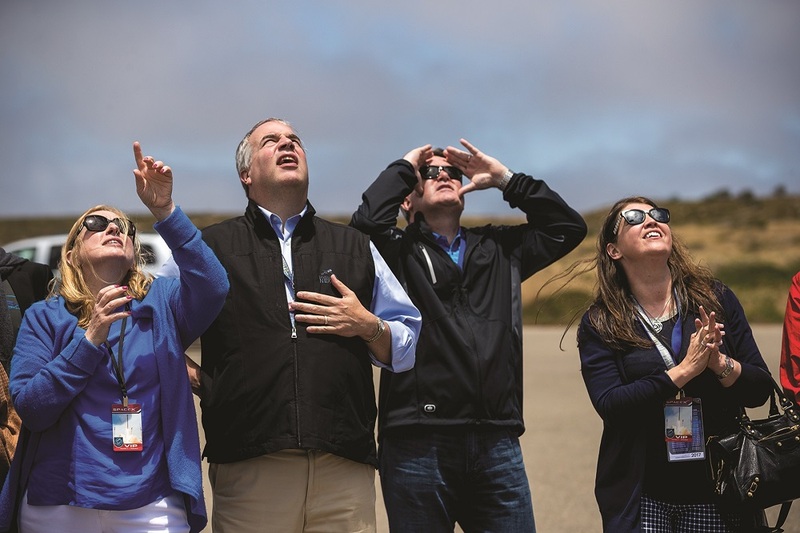 But as Iridium finishes its new constellation, it’s facing a changing competitive landscape. As one of the few survivors from the previous generation of low Earth orbit constellations from the 1990s, it’s now up against a new wave of competitors planning megaconstellations of hundreds or thousands of satellites, and with bandwidth far beyond what Iridium Next can offer. Is Iridium doomed again? The company’s executives aren’t worried. They acknowledge that, while Iridium Next can provide more bandwidth than the original system, it’s still much slower than the various constellations under development. Instead, the company is focusing on its ability to provide reliable, cost-effective services in key sectors, from aviation and maritime to the emerging Internet of Things (IoT) market, where speed is less critical. 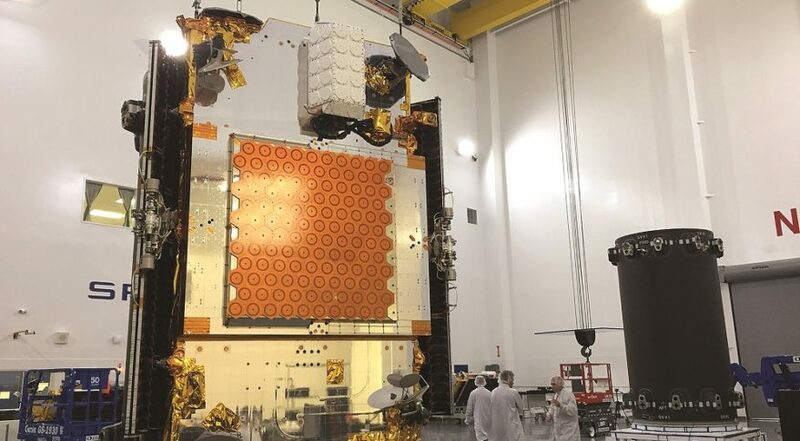 Bryan Hartin, the executive vice president for sales and marketing at Iridium, made the argument at the recent Satellite 2018 conference in Washington that his company’s system could co-exist with, and even complement, those broadband constellations and other alternatives. He sat down with SpaceNews to discuss the deployment of Iridium Next, its business case and the company’s financing efforts. How is the deployment of the Iridium Next constellation going? It’s going well. Last year we had four successful launches. I was able to attend all four of them. It’s just been spectacular. But as exciting as the launches are, the real thing that we care about is the satellites: could we acquire them, and could we put them into service? And the good news is that out of the 40 that have launched 34 of those are in service. There’s nothing wrong with the other six. They’re just drifting to their final location, which should happen toward the middle of this year. So we’re very excited about that. In terms of completing the constellation, we’ve got four more launches. It’s going to be a little bit more of a condensed time frame than it was last year. But we should be completing the constellation toward the middle of this year. We’re saying August now in terms of when the constellation launches will be done and the drifters will be in place. 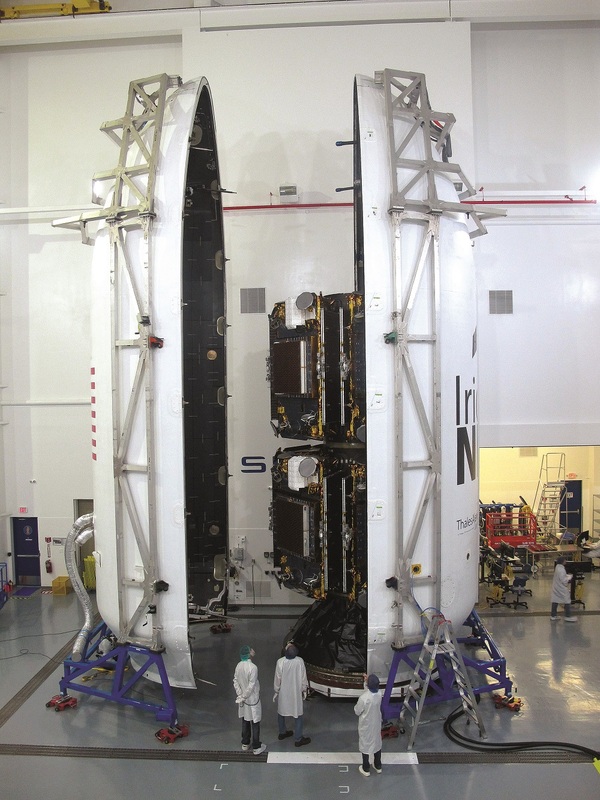 How are the Iridium Next satellites being used for new or existing services? Those 34 that are in service support all our existing customers. So whether we’ve got customers in aviation, maritime, land mobile or IoT, they have had no disruption to their service and they have not had to upgrade or touch their equipment at all. That was a big design criterion for us, that we did not have to do any hardware changes or touch the existing subscribers. And then the new products and services are what we call Certus. We have four Value-Added Manufacturer, or VAM, partners to build the products across the four verticals. We’ve got Cobham who’s building our maritime product; Thales, who is building products in aviation, maritime and land mobile; and then L-3 and Rockwell Collins are building aviation products. Cobham and Thales have their products in sea trials and the results so far are good. The key differentiator for us was Certus. It’s not just the fact that we have a new constellation but that it gives us the ability to offer what we call true broadband speeds in the MSS space. So our wheelhouse with the initial products is going to be 350 [kilobits per second] transmit and 700 receive. We’re hitting those speeds in the tests on the actual vessels today. And that’s important because 350/700 speed provides us with a superior alternative to Inmarsat when it comes to comparing us to their BGAN, FleetBroadband and SwiftBroadband products. Overall, we feel really good about where we’re at. What customer segments are expressing the most interest: aviation, maritime or land mobile? It’s been really solid across the three, I think primarily for a couple of reasons. One, we’re able to offer the speeds that we’ve talked about, this 350/700, and the partners all know that we can deliver on that. It gives a superior alternative to Inmarsat but it also gives choice. Inmarsat has sort of a monopoly and has taken advantage of some of these service providers, and they are eager to have a choice, a real alternative. The other thing is our strategy this time in terms of the product: we’re not doing it all ourselves. We’re relying on these VAMs to do that and they’re world-class companies. Certus is Latin for certain, reliable and sure, and that’s what we want to stand for, particularly being really the last MSS provider to solely focus on the L-band. We complement VSAT. We’ve got a lot of vessels today that will deploy our L-band product to back up VSAT, but we’re not here to compete with VSAT. We’re happy to provide Certus if somebody doesn’t think they need VSAT, but if they want to have a complement the VSAT, we want Iridium Certus to be the de facto standard for VSAT backup globally. 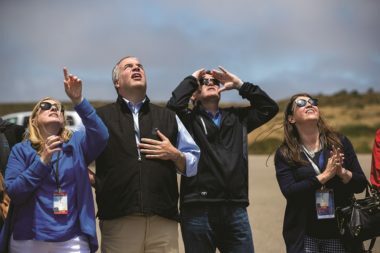 As you’ve been developing Iridium Next, a whole new generation of LEO constellations has emerged, many of which promise broadband services much faster than Iridium can offer. How do you compete against them? We’ll use OneWeb as an example. So everybody comes to me and says, “OneWeb’s LEO, you’re LEO, and they offer higher speeds that are going to put you out of business.” But there are a few key differences. They’re LEO, but they’re not L-band, they’re Ku-band. We’ve got global coverage and L-band is just more reliable than Ku. That’s why I mentioned the VSAT providers in maritime, they all have L-band backup. Whether it’s weather or you get out of coverage, they have to have a backup to be able to communicate. With Ku, they may have global coverage but it’s just not going to work all the time. If it’s raining cats and dogs in the Straits of Malacca or Singapore, Ku doesn’t work. That’s why you have to have L-band backup. The other differentiator is the crosslinks. That’s been the mainstay of our architecture, which gives us the ability to offer this global coverage but we don’t have to rely on all these gateways via the crosslinks. If you originate a call in Australia and you’re trying to call me in Washington D.C., it traverses the satellites and drops in our primary gateway in Tempe. So that helps reduce costs. They’re going to have to support all those gateways, and how are they going to do that in the ocean? I’m not totally sure. And then there’s speed. So, yes, the speeds that they offer are a lot faster than what I just recited to you in terms of 350/700. But we run into that today with VSAT and, like I said, I’m not here to compete with that. I’ll complement them. They need L-band back up in different parts of the world or different verticals. We’ll do that just like we do today with Intelsat and SES and Eutelsat and ViaSat. I view them kind of as another VSAT operator that just so happens to be in LEO versus GEO. One of those companies planning a broadband constellation is SpaceX, which is launching your Iridium Next satellites. Have you had any partnership discussions with them? Probably not as much as we have with some of the others. We would like them to stay focused on the launches. They’ve got enough to do there in our minds. The other question is what is Elon’s true focus: is it to be a new entrant for commercial satellite services here on Earth, or is this a building block for what he sees as what he needs for Mars? You’ve got to give him credit, they put two test satellites up in that one launch. We’ll see where that goes, but in my view they’re not somebody that’s necessarily going to compete with us. Given the progress Iridium is making, why does the company need to raise additional funding? Is it only because of delayed payments for Aireon’s aircraft-tracking payloads? We’re fully financed. It’s a $3 billion program and we’ve grown the business. We’ve met or overachieved our operational EBITDA estimates for the last three years. But what [Chief Financial Officer] Tom [Fitzpatrick] wanted to make sure is that we’ve got some financial flexibility and we can ensure our liquidity out for the next several years without having to depend on the Aireon payment or anything like that. And that’s what this does. It’s $360 million in five-year senior notes and Tom’s been working with the banks to get their concurrence that we can modify the existing financing agreements for this. It just gives us flexibility, and it ensures our liquidity well out in the future to 2023 and beyond. Do you see any issues completing that funding? No. Tom feels he’s done a lot of the legwork in advance. But that is one of the other key differences between us and some of the new entrants, but also some of our competitors. Take Globalstar or Orbcomm. They talked about replacements but they didn’t really have the thing fully financed to be able to guarantee to the marketplace that they were going to be able to do these replacements. And that’s one of the big differences between us and some of our competitors: we’re not doing four launches then scratching our head of how we’re going to do the next four. It’s all planned out with Thales and SpaceX. My mandate and my team’s mandate is that we’ve got to introduce Iridium Certus products and services, which is extremely important, but we’ve also got to maintain our existing business and I’m proud of the fact that we’ve been able to do so. We keep the business running, and running successfully, demonstrating that growth so that when Tom and [CEO] Matt [Desch] go out to start talking about this public offering they’ve got a good solid business track record to refer to.